But now it's over, I can craft again, yipee!! 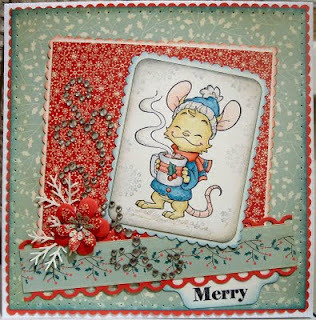 This is my entry for the Crafts 4 Eternity challenge this week, using their sketch, punches & holly combined with Cute Card Thursday's call for primary colours. Out came little Henry again & are you impressed with my bling flourish? I am!! Another bargain from the discount store near me, 99p for 2 swirls!! I'm keeping my fingers crossed some pearl ones might appear someday! Oh wow love your adorable card! Love your take on the challenge Nikki, very warm and cosy card with that cute image. Thanks for joining us at c4e this week. I just love this! The colouring is wonderful & those DPs are delish! Where are they from & where's this discount store with the cheap swirls, they look fab! Thanksd for joining us at C4E this week. This is adorable Nikki! I love these images and this card is just fabulous with it! The colors are so cool together and love your flourish!